Welcome to my 'corner' of the web. My name is Norman Frederick Charles III and my partner is Lord Jonathan Boyd. Together we were the ROYAL KANGAROOS! Lord Jonathon Boyd and myself Norman Frederick Charles III. 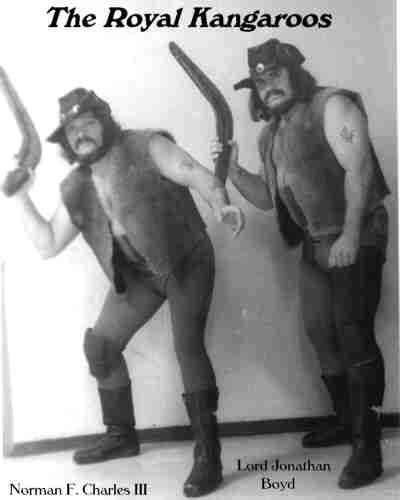 We were two Australian Wrestlers who formed the famous team 'The Royal Kangaroos'. We are both cousins, and started wrestling at a very early age. We both wrestled very successfully as amateurs. When we both turned professional, we wrestled separately for quite some time, then joined forces going on to become South Pacific world champions which covered Australia, New Zealand, New Guinea, French Numea, Western Samoa, and parts of Africa. We have appeared all over the world, including the Sumo Hall in Tokyo and before the Queen of England (not once but twice) at Covent Gardens and Earl's Court London, and have wrestled before 130,000 people in India to name a few. The Turnbuckle - Home of the Royal Kangaroos Tag Team Wrestling Champions in Cyberspace.